Nesting highs and woes …..
We’re always excited to find a new bird nest but I suppose some species we watch more keenly than others. 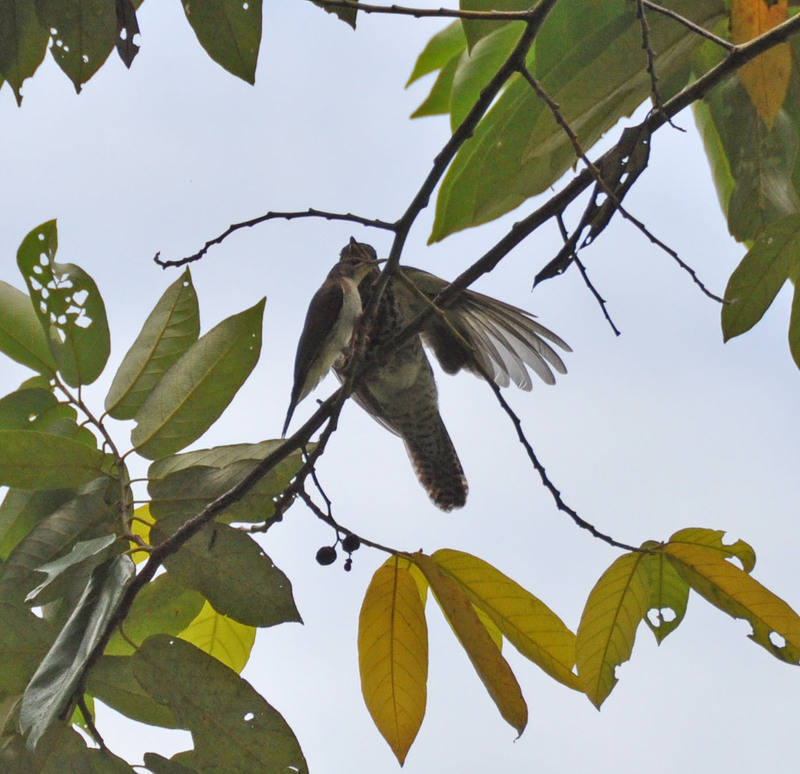 There have been no further reports on the Papuan Frogmouth (Podargus papuensis) as the nest was deserted two weeks after we first observed it. We have a lot of hypothetical scenarios but no real clues as to what could have happened. Fortunately the nesting Frogmouths on the Daintree River have been having more success. The eggs of a resident pair of Bush Stone Curlew (Burhinus grallarius) disappeared and we have Amethystine Python high on the list of suspects as there was no sign of eggshell in the vicinity and Montys are very partial to egg. 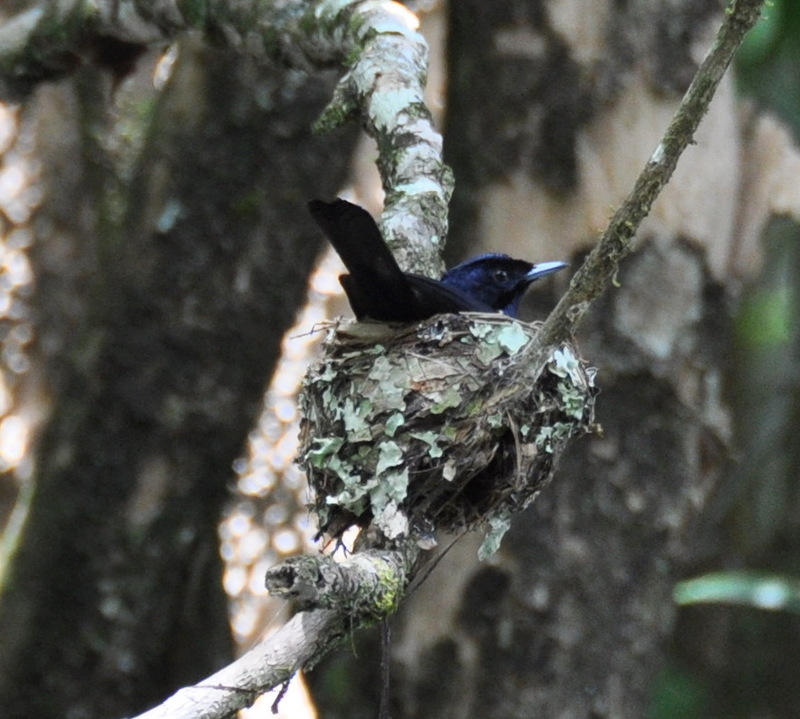 Now Shining Flycatchers (Myiagra alecto) are nesting at the back of one of our islands on Graham’s Pond – Allen has sighted one hatchling but Black Butcherbirds (Cracticus quoyi) are making the Flycatchers understandably nervous. We are trying not to disturb them too much. The nest is beautifully camouflaged with decorative lichen and snuggly positioned in the bend of a branch which is over the water. The male is sitting on the nest in the first photograph taken a week ago and in the second photo the female approaches the nest with some food for the hatchling. Brown-backed Honeyeaters (Ramsayornis modestus) successfully rear young every year but not always their own as they are parasitised by Brush Cuckoo (Cacomantis variolosus). These delightfully busy honeyeaters build a lovely domed nest, usually from paperbark strips, suspended on a branch over or very near to water. Our paperbark swamps are perfect habitat for them and the numbers certainly appear to have increased in the last few years – they are resident from about September to April, apparently moving north for the winter months. 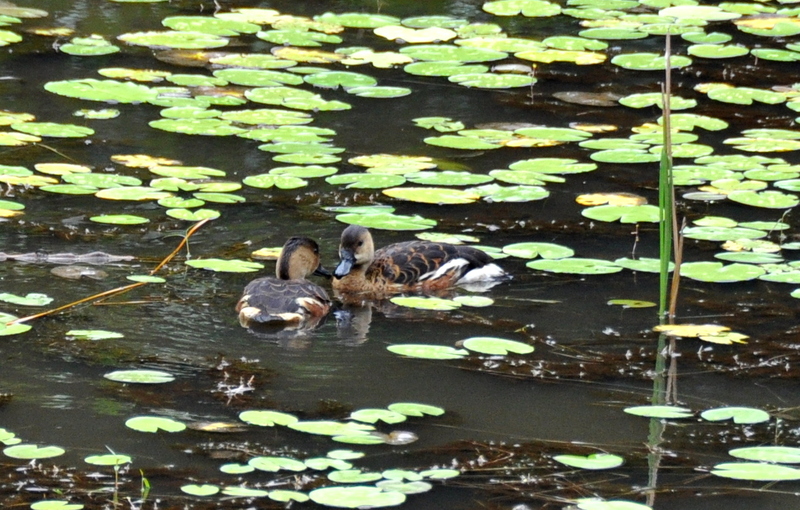 Not showing signs of breeding but lovely to watch on the pond. Wandering Whistling-Ducks (Dendrocygna arcuata) usually depart when heavy rains start but the rain has hardly stopped this year and this pair have been residing on the property for a few months now. They may not be so content when the property floods and I don’t think there is any doubt that we will experience floods this year as we are already at saturation point! This entry was posted in Bird Observations and tagged Brown-backed Honeyeater, Brush Cuckoo, Bush Stone-curlew, Papuan Frogmouth, Shining Flycatcher, Wandering Whistling-duck. Bookmark the permalink. I love the second photo of the female near the nest – and what a cute little nest! And soon you’ll be here and able to see it with your own eyes!! Well the birds will still be about but not still on the nest …. Sounds like nesting over water is a good strategy. Thanks Denis, nesting over water is mostly a good idea although there have been occasions on the Daintree river when the birds haven’t anticipated king tides. 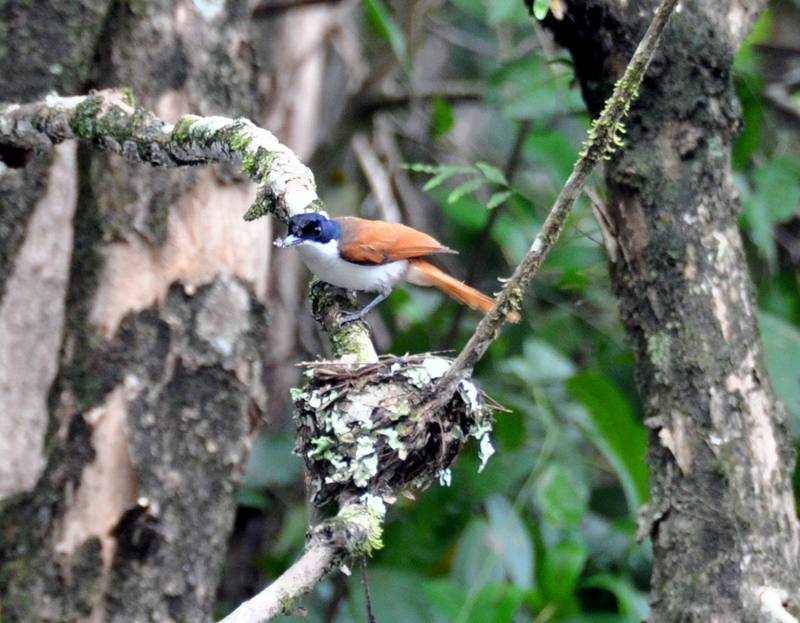 Love that Flycatcher’s nest construction. Funny though – beautifully camouflaged, except when he sits on it!? Please keep blogging. I don’t comment often these days, but I do look in a fair bit. Thank you for your kind wishes Gouldiae – your blog is one of a small number that we regularly check but neither do we always comment ….and I will keep blogging although sometimes it is a little erratic!